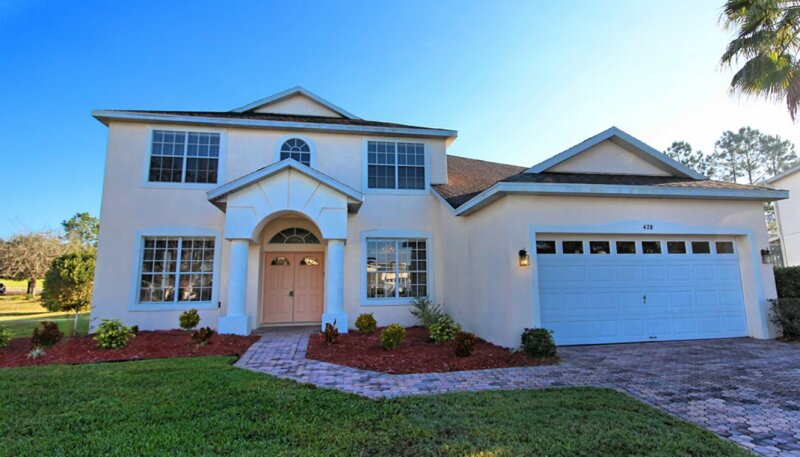 This bright and spacious 5 bedroom 3 bath villa with open golf course views offers an excellent vacation accommodation with large north-east facing swimming pool & spa and WiFi internet access throughout the villa. 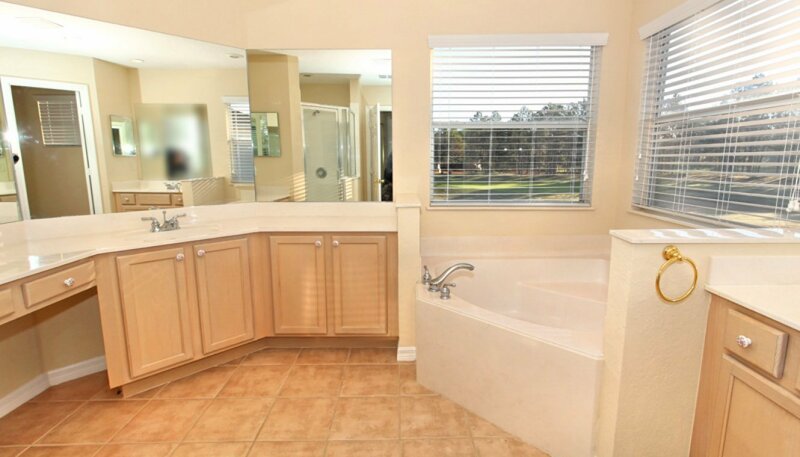 Pool bathroom with bath & shower over, WC & single vanity. As you enter the villa you are greeted with a fabulous hallway with living room to the left, dining area on the right and impressive staircase in front of you. 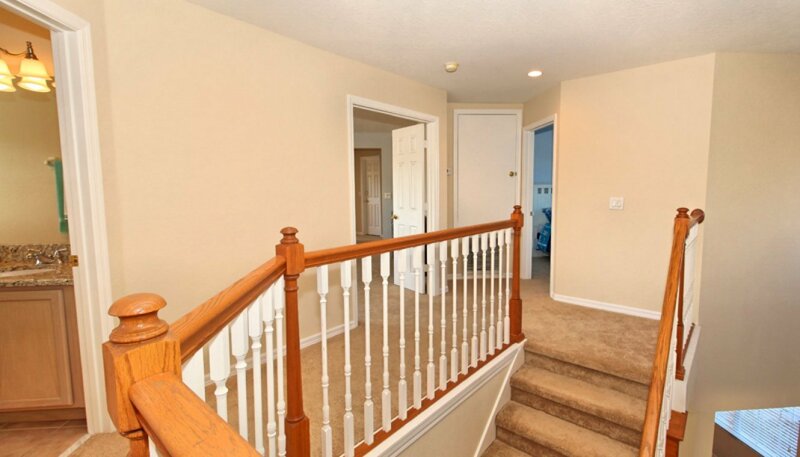 To the right of the staircase, the hallway then leads onto the spacious family room beyond. 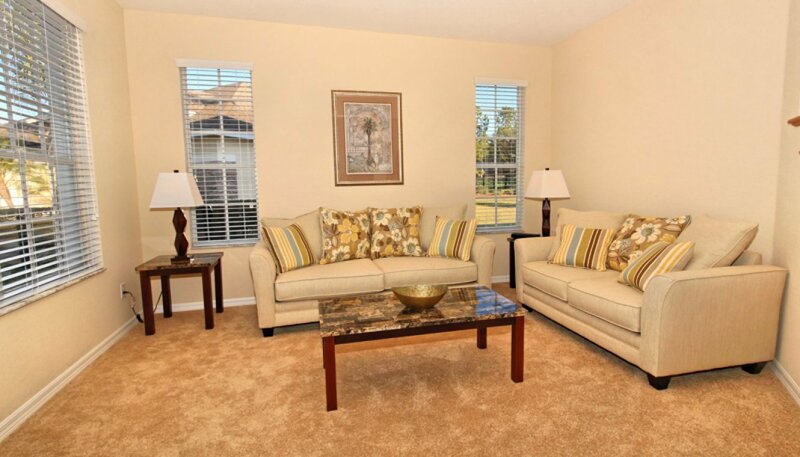 The elegant living room accessed off the entrance foyer through double doors has 2 sofas with seating for up to 6. The perfect place to relax with a book after a day out exploring. 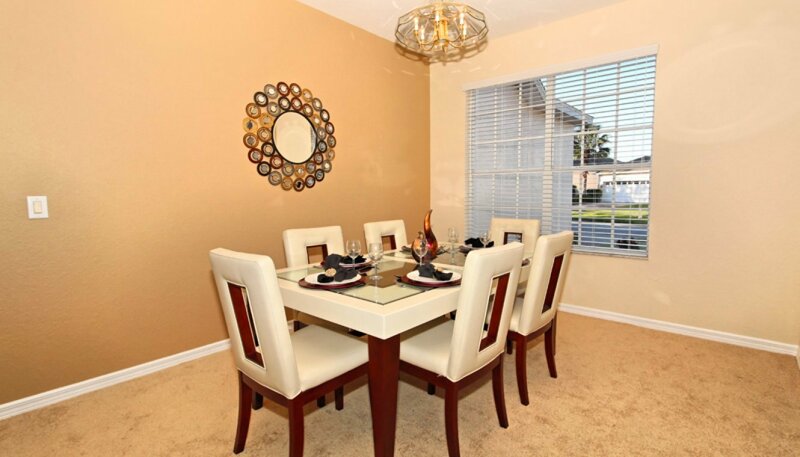 Exceptionally spacious open-plan family room, nook and kitchen area. 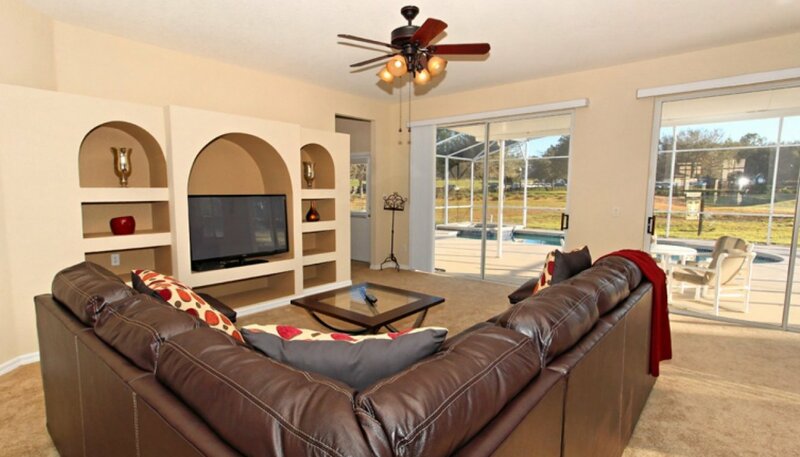 The family room overlooks the pool and the golf course beyond. 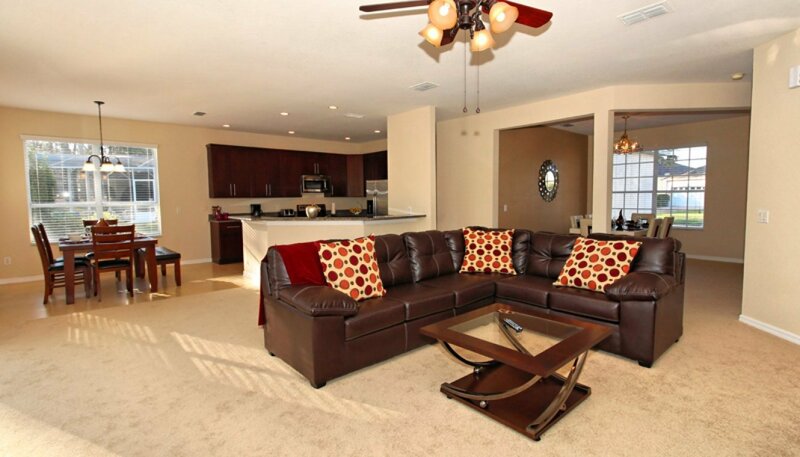 Furnished with large comfortable sectional L shaped sofa so there's plenty of space to relax and unwind. 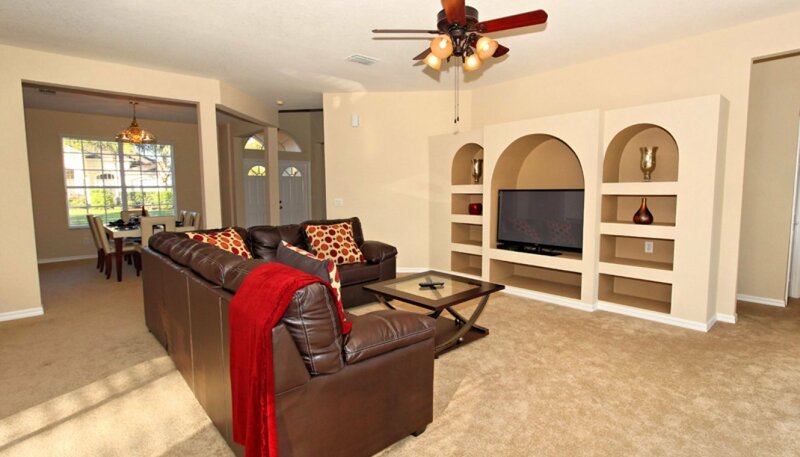 There's a large LCD HDTV with DVD player so you can enjoy a movie together. 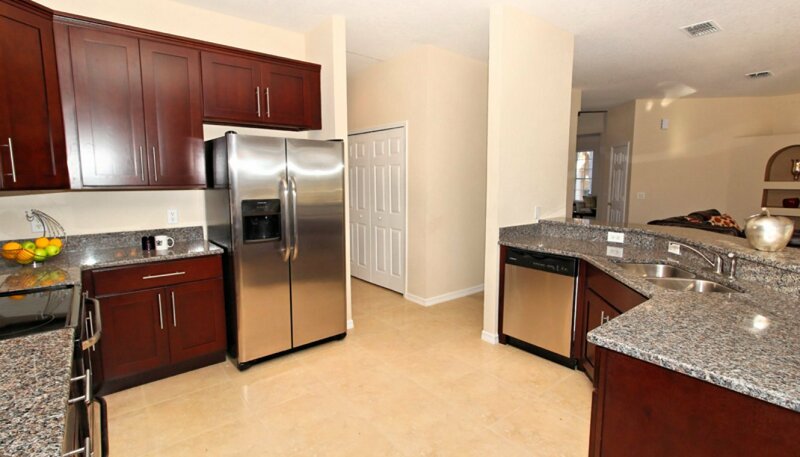 Luxury Shaker style kitchen has quality stainless steel appliances and granite work surfaces. 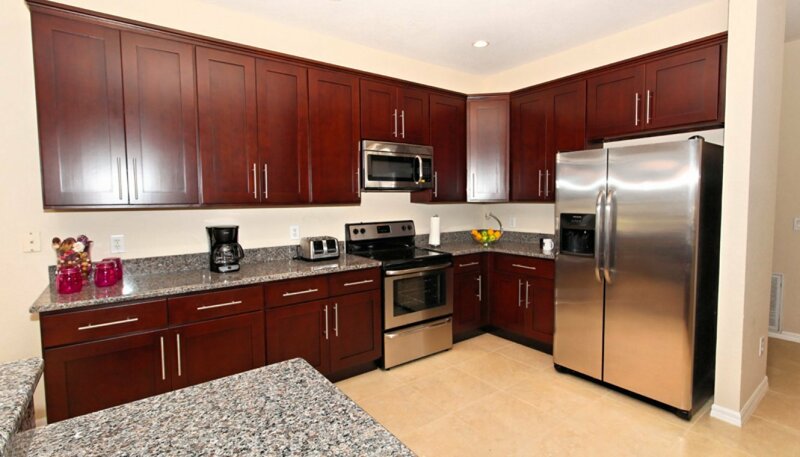 It also boasts all the amenities including dishwasher, stove with oven, microwave, refrigerator & freezer with automatic water and ice dispenser, waste disposal, coffee maker, blender, toaster & kettle. Off the kitchen is a large pantry. 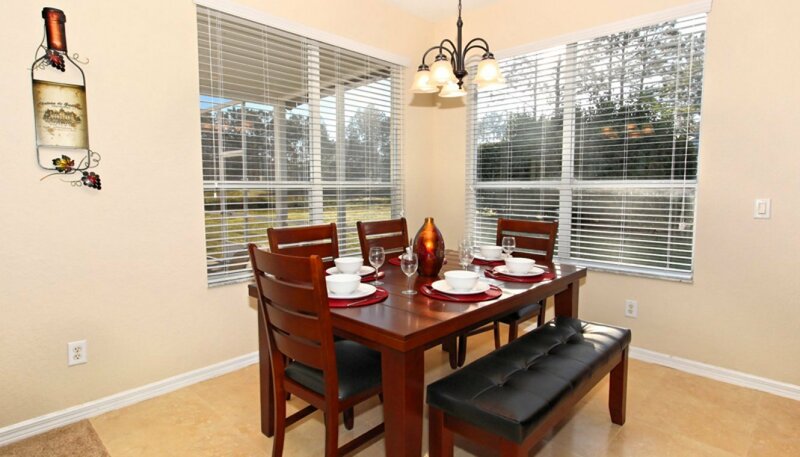 This informal dining area adjacent to the kitchen with its great views over pool deck offers seating for 6 in comfort, with open access to the kitchen. This bedroom comes equipped with a queen sized bed with matching nightstands, lamps and chest of drawers and large built-in wardrobe. Being on the ground floor next to a bathroom, this bedroom is ideal for guests who may not be able to access the upstairs bedrooms. 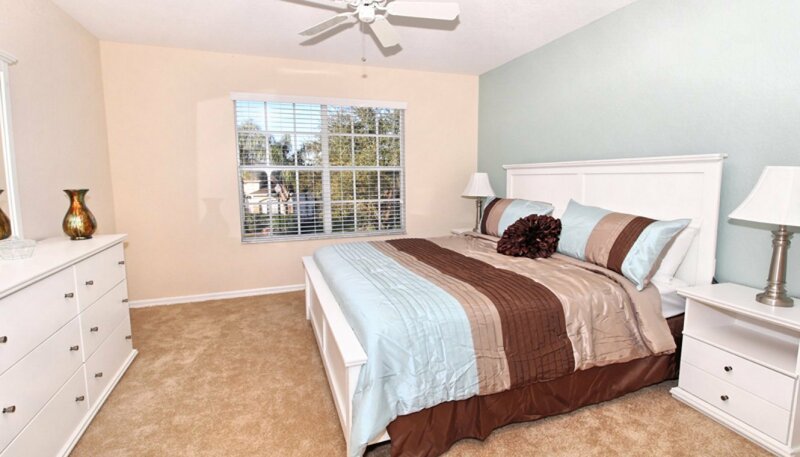 Adjacent to bedroom 5 is a pool bathroom with door leading directly onto the pool deck. 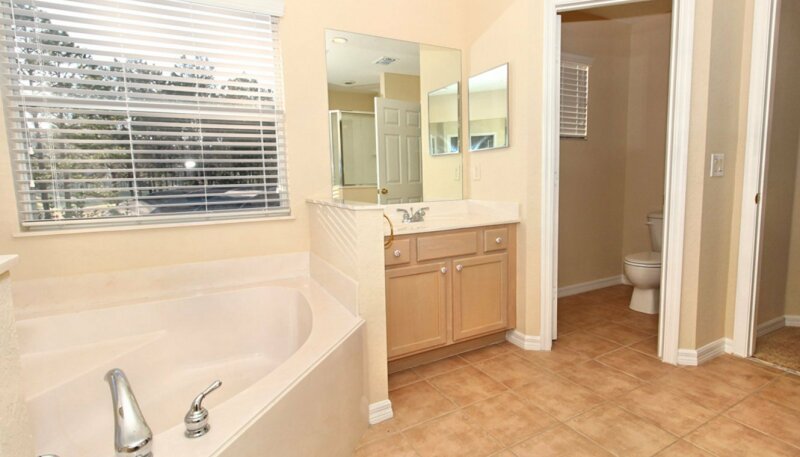 This bathroom is fully equipped with bath and shower over, single sink inset into marble countertop and WC. We also provide a hair dryer. Being on the ground floor, the bathroom is ideally located for guests who may not be able to access the upstairs bedrooms. 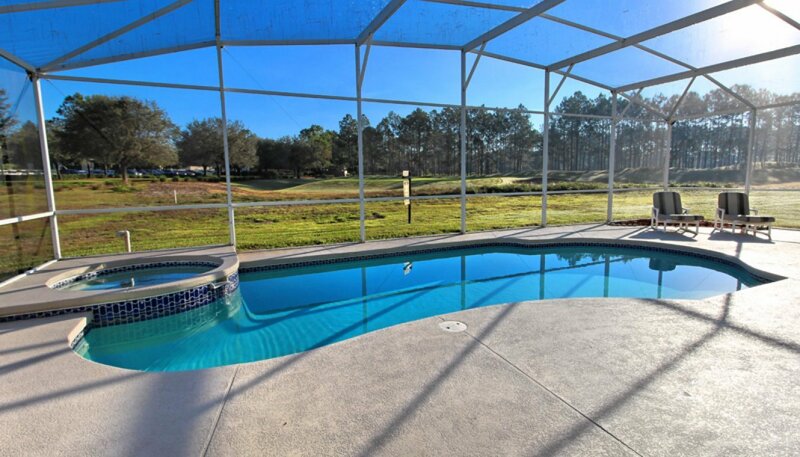 The large pool with sunny north-east facing extended deck has open views over golf course. 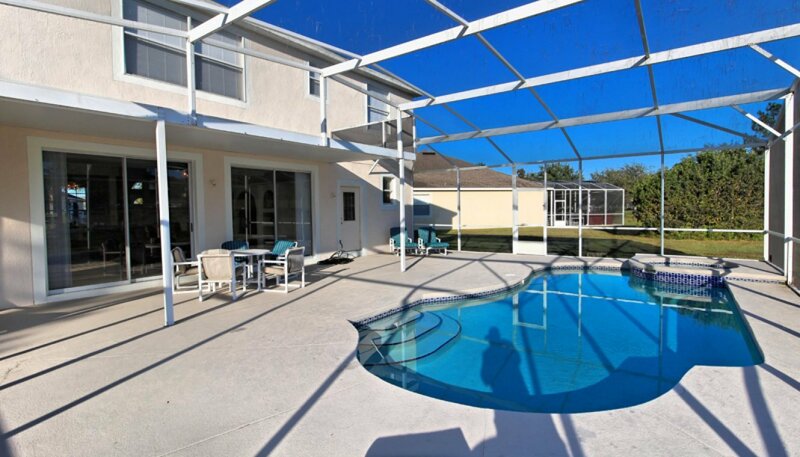 We have provided 6 sun loungers for your sunbathing comfort and a patio table with 5 chairs under the shady covered lanai. The large master bedroom with its wonderful views over the pool deck has been furnished with a king-sized sleigh bed, matching nightstands, lamps, chest of drawers with mirror above, chaise lounge, walk-in wardrobe and ceiling fan. 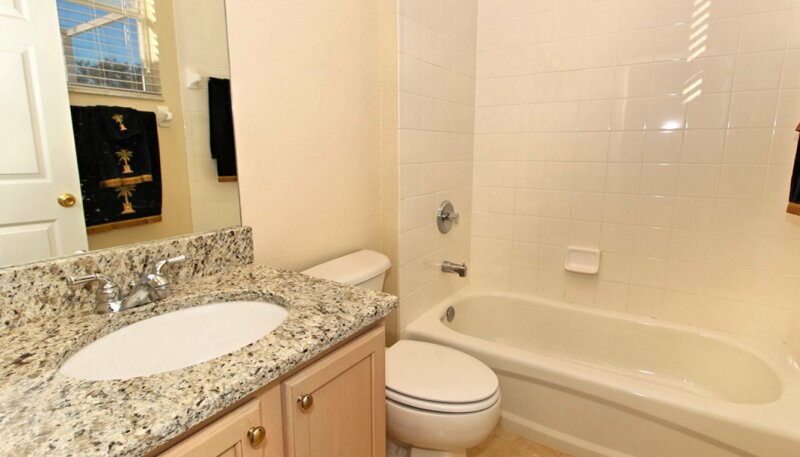 The connecting spacious ensuite bathroom has a corner bath, large walk-in double shower, his & hers sinks and separate WC. We also provide a hairdryer. 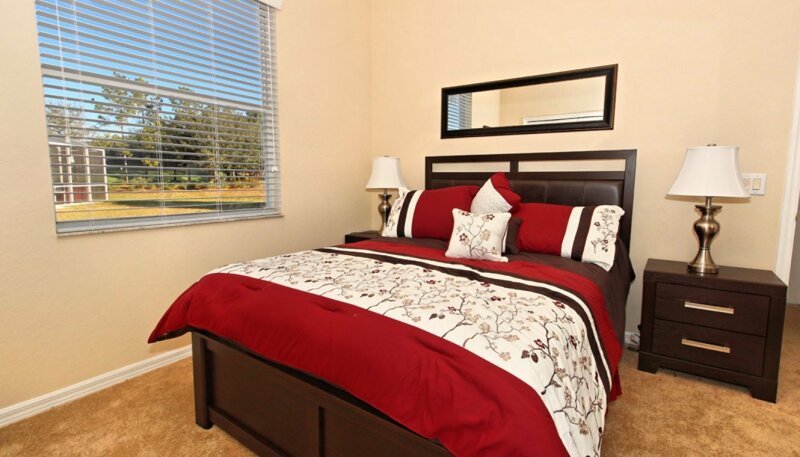 This bedroom comes equipped with a king sized bed with matching nightstands, lamps, chest of drawers with mirror over, ceiling fan and walk-in wardrobe. 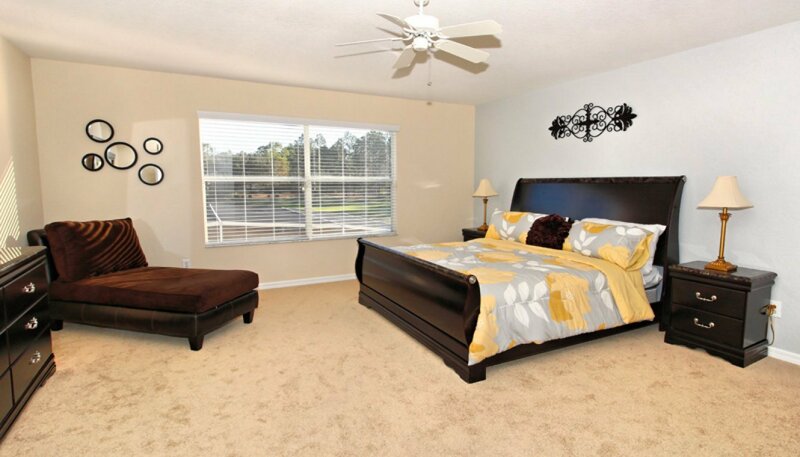 This bedroom with views over golf course features twin beds with matching shared nightstand, lamp, chest of drawers, walk-in wardrobe and ceiling fan. 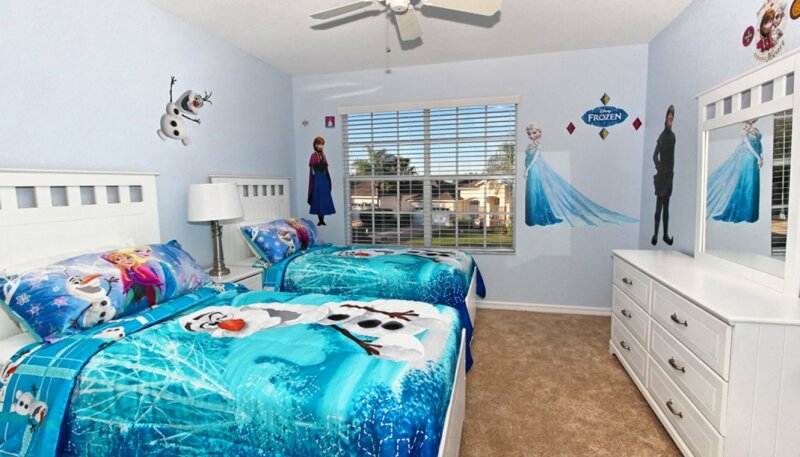 This bedroom is Frozen themed so perfect for any young princesses or princes in training. It comes equipped with twin sized beds with shared matching nightstand, lamp, chest of drawers with mirror above, ceiling fan and walk-in wardrobe. 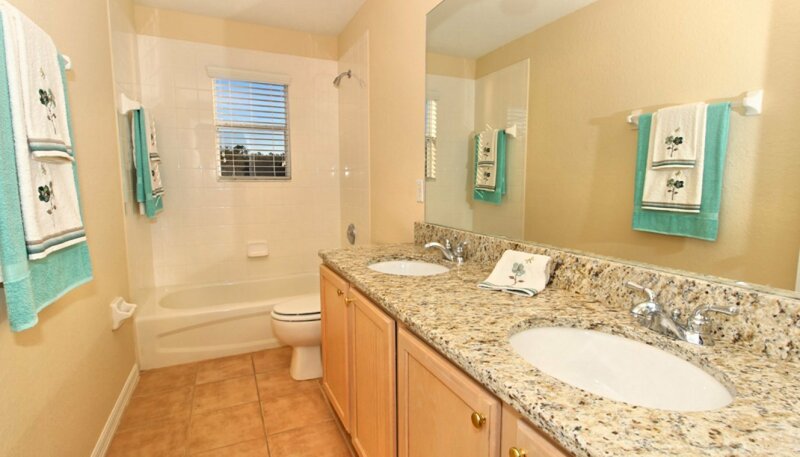 The family bathroom is conveniently located and comes with double washbasins inset in marble countertop, bath with shower over and WC. We also provide a hair dryer. 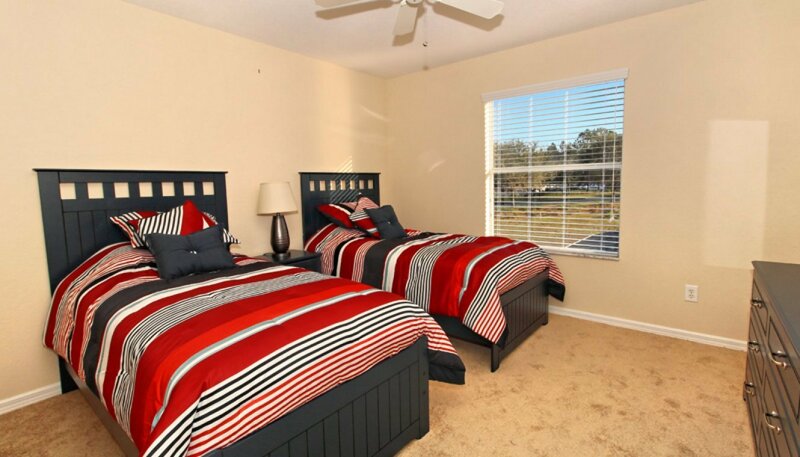 There are ample towels and linens provided although we do ask that no towels be removed from the house. If you plan on travelling to the beach on either coastline, please bring your own beach towels or purchase them locally for very little money.